Delivering a superior level of service is how we grow your business! Imaging Supplies Warehouse… dedicated to your success. Imaging Supplies Warehouse, is a centrally located Master Distributor of garment and gift personalization supplies, notably the OKI White Toner Laser Printers. In addition to these revolutionary white toner printers, we stock a large offering of heat transfer medias and a full catalog of dye-sublimation imprintables and supplies. We operate quietly in the background and dedicate our success to the 116 (and growing!) distributors we support with best-in-class customer service and industry education. We dedicate ourselves, first and foremost, on the success of your business — ISW offers best-in-class customer service to provide our customers the support and attention needed to help their businesses flourish. With our prime central location in St. Louis, Missouri, as well as working through a network of vendor locations, we are able to provide the entire nation with industry best order processing times, shipping same day in most cases. Your customers depend on you for quality products, and it is our opportunity to provide your business with high-quality printing solutions and media for apparel, promotional products, and more. We provide our dedicated network of resellers the resources and education they need to get ahead in a highly competitive industry. Over 20 years of experience in the industry allow us to pass excellent education, dealer resources, and quality solutions to our customers. Why should you become an ISW Reseller? IC-SPLIT, in combination with the FOREVER Transfer Media, opens up incredible opportunities for all users. 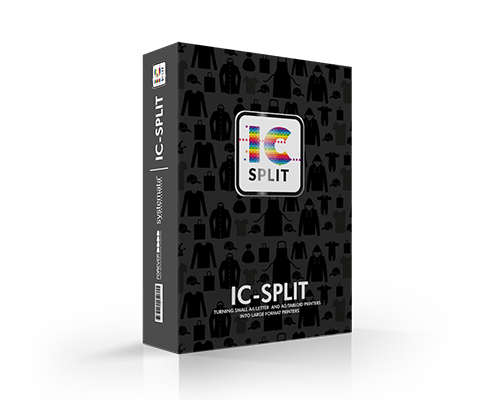 IC Split is the software to produce large formats in DIN A2/Tabloid „Extra Plus“ or special widths and lengths with small A4/Letter or A3/Tabloid printers. The solutions makes it possible to easily produce DIN A3/Tabloid format using a A4/Letter printer or DIN A2/Tabloid „Extra Plus“ format using a DIN A3/Tabloid printer with just a few mouse clicks. The self-explanatory software simply divides the print image into two, three or more parts depending on the desired final format. These are later reassembled on the carrier fabric to form the large image. Looking to build a Lucrative Business? Reselling printing equipment, blank products, and consumables to other businesses for imprinting and personalizing purposes is in high-demand. Ask us how to get started.